Despite their huge popularity, 1980 was far from being a tremendous year for Luv'. Patty Brard left the group and was replaced by Ria Thielsch. Shortly after this line-up change, Marga Scheide suffered from a nervous breakdown which brought Luv's career to a standstill. In February 1981, Philips Records released Patty's first solo single entitled "Hold On To Love". The pop-rock track was taken from her "All The Way" LP. The album was recorded in the best studios in Los Angeles, CA and produced by her lover Carlo Nasi, a wealthy Italian music publisher, songwriter and producer ....as well as one of the heirs of the FIAT empire. He could afford the "crème de la crème" of session musicians for Patty. Legendary keyboard player Billy Preston, Brazilian percussionist Paulinho Da Costa and American composer Richard Gibbs were hired on Miss Brard's record. 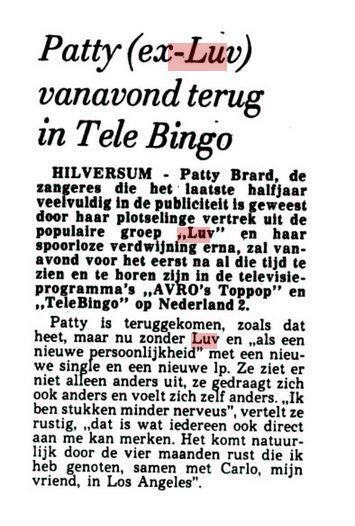 Patty promoted her music on Holland's main TV shows (including TopPop, Telebingo and Nederland Muziekland). Hold On To Love became a hit single: #19 on the Dutch Top 40 and #14 on the Nationale Hitparade in the Netherlands, #4 on the BRT Top 30 in Belgium and #12 on the South African Charts. Luv' was not active as they stopped their TV and stage performances. Meanwhile, the group's entourage was busy with other projects. 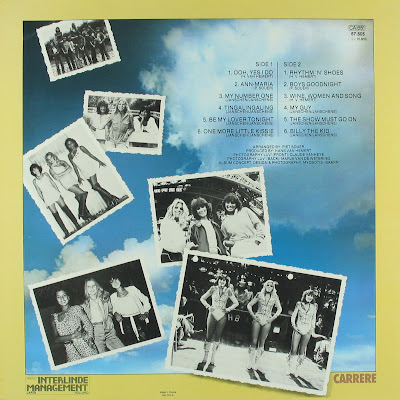 Piet Souer (who co-wrote Luv's songs with Hans van Hemert) had a #1 hit (Shine Up) in Holland and Belgium with another female pop act Doris D. & The Pins. In an interview published on February 21st in the newspaper Het Vrije Volk, Souer said about the uncertain future of the trio: "A lot has got to do with motivation. If the girls work hard for it, they'll be back for good." Unfortunately, the motivation had gone and the ladies surrendered. 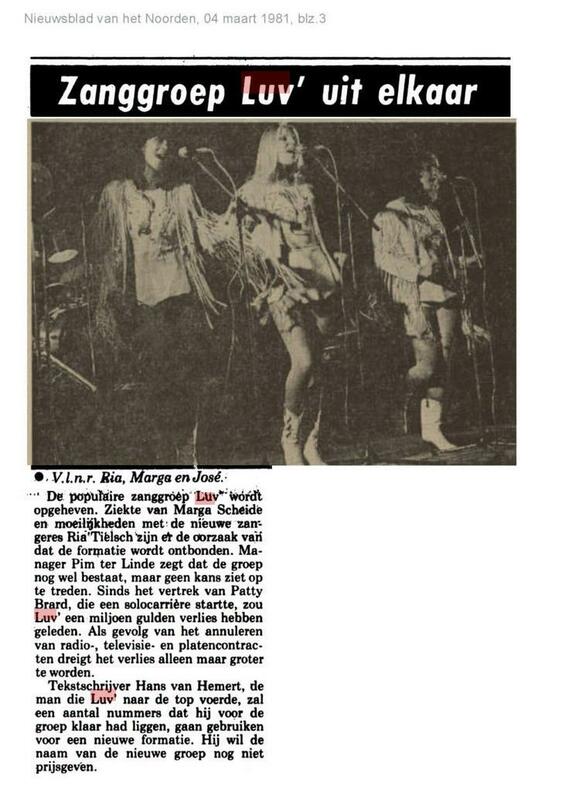 In early March 1981, Manager Pim ter Linde announced the group's break-up to the media. 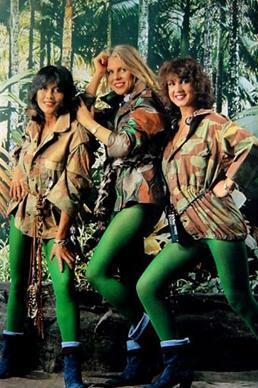 The three singers kept a low profile for several months. 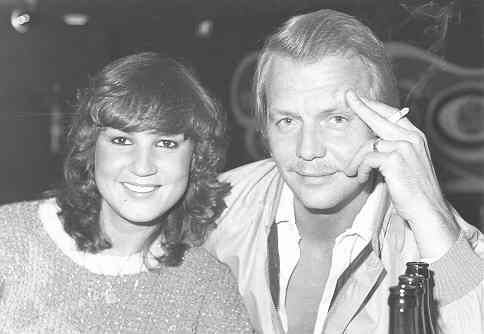 Marga and José secretly provided vocals on "Tick-a-thumps my heart", a single by Babe (one of Luv's rivals) which reached the Top 20 in Belgium and the Netherlands in the summer of 1981. Though all the songs of Babe were written by Peter Koelewijn, Tick-a-thumps was an exception as Hans van Hemert wrote and produced it. Marga was in charge of Babe's styling. The fans were very disappointed in Luv's break-up. 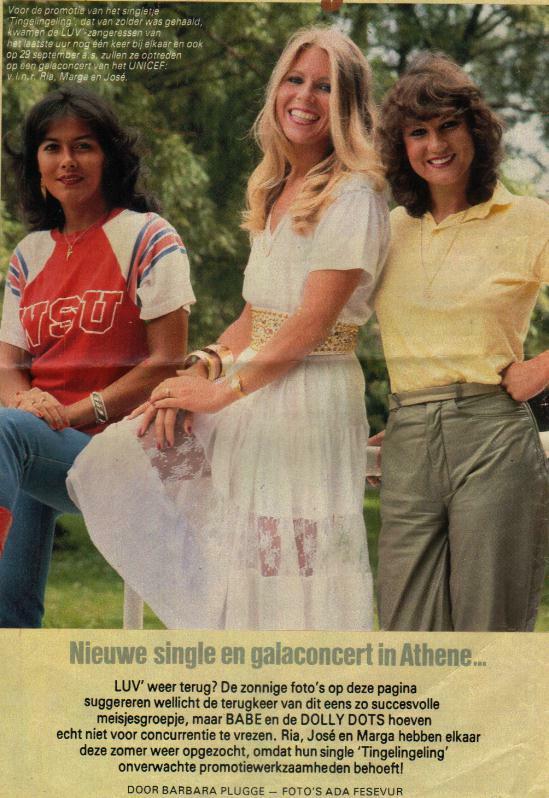 To the public's great surprise, the trio appeared at the Efteling theme park during Hitkrant's zomerspelen (a summer multi-sport event with celebrities which was sponsored by teen magazine Hitkrant). On July 22nd, they made a farewell performance on Nederland Muziekland, a successful music show on Veronica channel which featured the "who's who" of Dutch singers and bands. The program was taped in Spakenburg, Netherlands. The ladies performed "Tingalingaling", a post-disco/synthpop track taken from their "Forever Yours" album and released as a single by CNR/Carrere Records. Marga was at that time reluctant to plan a comeback and José intended to launch her solo career. 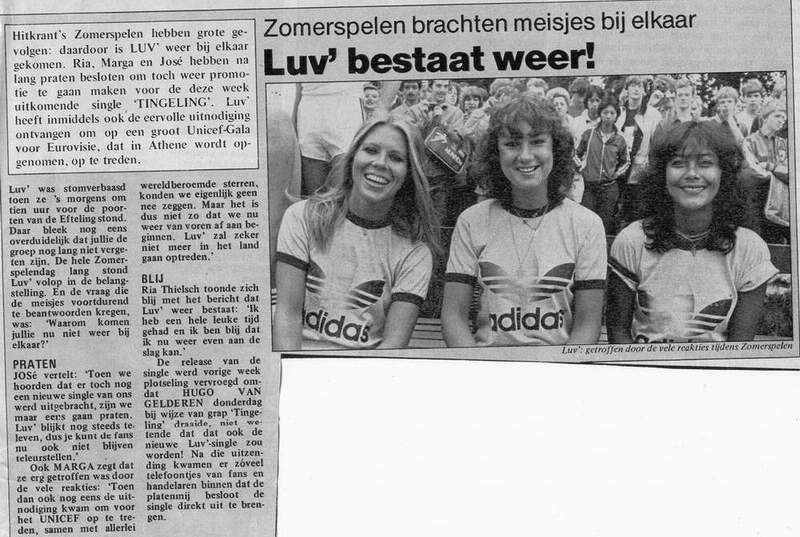 However, Willem-Jan van de Wetering (general manager of Luv's record company) convinced them to appear on this unique TV show. 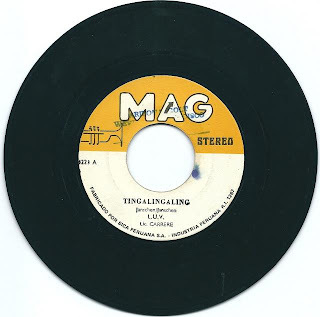 Because of a lack of promotion due to Luv's demise, "Tingalingaling" was a moderate hit in the Netherlands. It peaked at #29 on the Dutch Top 40 and #15 on the Nationale Hitparade in Holland. Moreover, the ladies were expected to sing at a UNICEF gala in Greece but their participation in this show was cancelled. 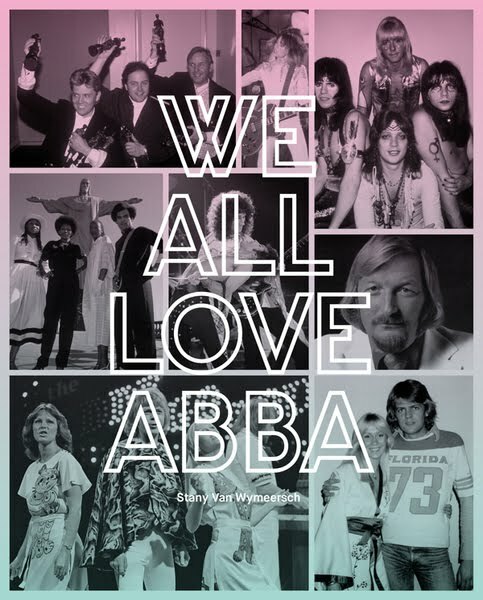 Then, a compilation (featuring the repertoire from 1979 to 1981 and entitled "Goodbye Luv'") came out. During the release party of this anthology held in Pim ter Linde's villa, British pop singer Keith Marshall gave Marga and José the first copy of this album. It marked the end of a short and intense international success story. 12 singles, 4 albums, 13 gold and platinum awards, a string of hits scored in a dozen countries, one Dutch export award (Conamus Export Price), 7 million records sales, TV shows, magazines covers, heavy rotation on the radio...Luv' can be proud of their achievement. Keith Marshall, Marga Scheide and José Hoebee at the release party of "Goodbye Luv"
Marga enjoyed life with her boyfriend, media mogul John de Mol. She later supervised the styling of bands and recording artists. Ria went on with her modelling career. 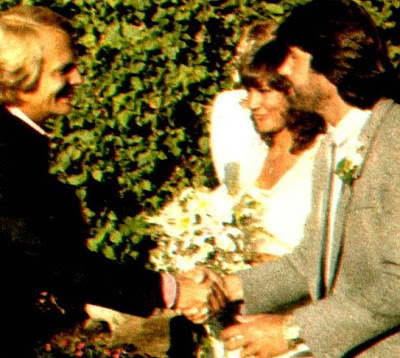 José and record producer Will Hoebee got married in October. The wedding reception took place in David Soul's villa in Los Angeles. Soul became world famous for his role in the TV series "Starsky & Hutch" in the late 1970's. Will produced his album "Best Days Of Our Lives " in 1981. 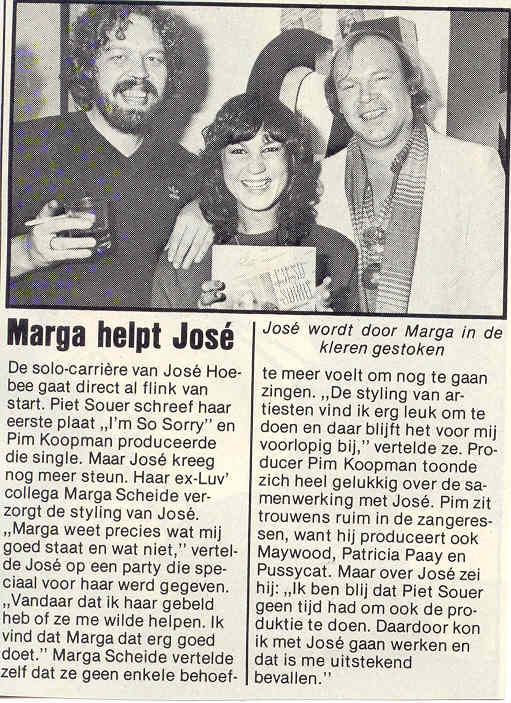 Just before the launch of her solo career, José recorded the background vocals on the first album of Doris D. & The Pins produced by Piet Souer. She was not credited on the record sleeve, which was common practice in the music industry at the time (it was before Milli Vanilli scandal). After Luv's glory era, José's challenge was to prove that she could score hit records on her own. As the most talented member of the female pop act, she recorded the majority of the vocal lines in the studio. Expectations were high when she went solo. December 1981 was a milestone in her existence when CNR/Carrere Records put out her single "I'm so sorry". The song was written by Piet Souer and produced by Pim Koopman (member of the pop-rock band Kayak and producer of the sister duo Maywood). José had a helping hand from Marga for her styling and her husband Will for musical expertise. Though the singer was surrounded by generous and devoted people, her debut record was not a mainstream success. It failed to break into the Dutch Top 40 and peaked at #39 on the Nationale Hitparade. French-Bulgarian chanteuse Sylvie Vartan covered it in 1982. Her version was entitled "La Sortie de Secours". José performing "I'm so sorry"
On December 31, Marga and José appeared on New Year's Eve TV program "Oud en nieuw in de veiling" (on NOS). They sang a funny version of "'t is genoeg" (Netherlands' Eurovision Song Contest entry in 1965 originally performed by Conny Vandenbos). 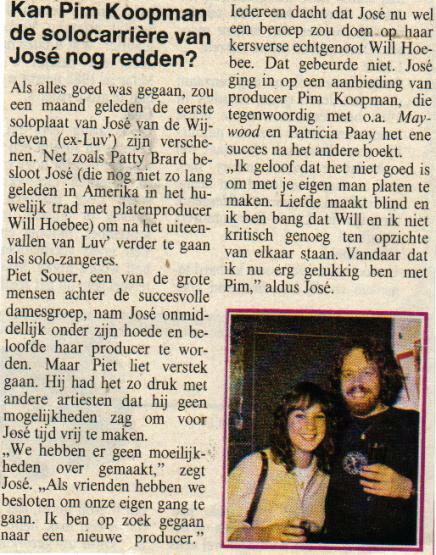 Marga & José on "Oud en Nieuw in de veiling"
1981 was a sad year for Luv's public. No-one expected that there would be several reunions in the future.